We had some heavy snow in early December. Around Christmas, it warmed up. Then, it rained. Our sump pump saw all this melt and rainwater coming and tried to run for the hills. It didn’t make it to the hills, but it shuffled just far enough to unplug itself. I can’t even blame this on a kid; I’m convinced the pump worked its own plug free of the outlet. Hours later, the pond on the basement floor alerted us the pump’s cowardice. When your basement floods, it’s good to have friends. Thanks to my wife, we have these. (I’m in charge of the gas and electric.) Good people stepped up with loans of wet/dry vacs and fans that helped us get things cleaned up in a much shorter time than I anticipated. For that, we are thankful. A flooded basement also affords you a good opportunity to assess the general helpfulness of your children. Yeah, they all want to help make cookies, but who’s really ready to get down and dirty in a crisis that doesn’t result in treats? Big Brother went bowling with his buddies. I can’t really blame him. If I could have gone bowling while somebody else cleaned up, I would have. Buster played on the Kindle. I’m sure he was playing a flooded basement game to collect useful restoration tips for me. Big Man was the true first responder of the day. As soon as he woke from his nap and got word of the trouble, he called for his boots. 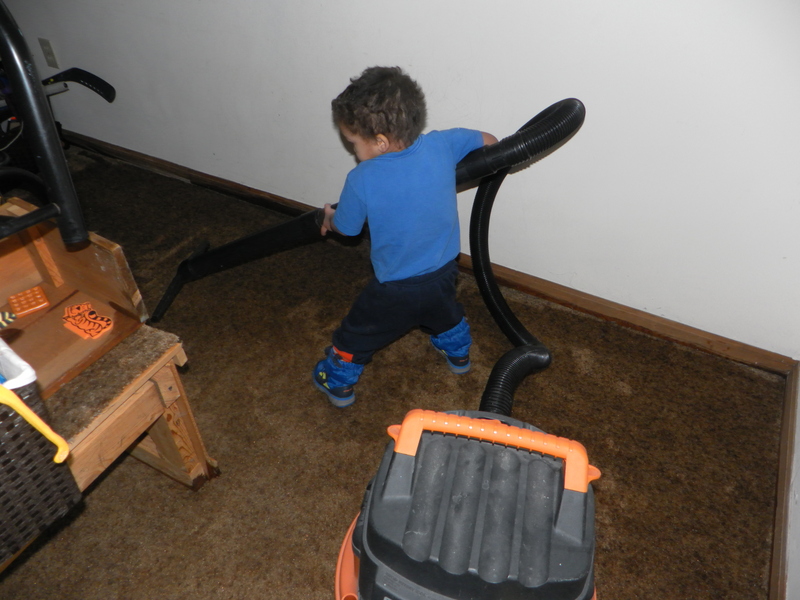 All his years of training on the family vacuum cleaner had been building toward this day. There was water on the floor and a shop vac to be manned. It was his moment. No task is too big; no boots too cute. I’m not upset at the other boys for not rushing to help. This kind of event is not the same adventure for boys their ages as it is for Big Man, and I certainly did not need all three of them underfoot as I cleaned. In the end, Big Man helped out more by providing spiritual comfort, cuteness, and perspective than by the amount of water he sucked up. He was the right guy at the right time for the right job. That’s why he came to help. Children have a way of knowing these things. I’m glad the others kept out of the way of my cleaning and of Big Man’s cheering me up. It worked out perfectly. Well, almost perfectly. It would have been just a little better if the other two were upstairs helping somebody make some cookies for when the basement work was done. This entry was posted in Toddler Trouble and tagged boys, children, Dads, family, fatherhood, floods, humor, parenting, Sons, toddlers. ← Christmas: Let’s do this thing! Sorry for the cowardly act of the sump, yet glad to see your youngest reveling in a chore to help dad. By the way, was it Big Man in the MSU PROMO? Yes, that was Big Man. He was over the moon when he saw himself on TV. That is quite the adorable picture of Big Man and the vacuum cleaner. We had the adventure of a flooded basement during the flood of 2013. We were pumped out three different times by three different fire departments, then again by my Dad’s shop vac, then one last time by a little sump pump we bought at Aubuchon. I got a few blog posts out of it. Thank God for the help of friends! I hope you stay dry. We don’t have an angry Mohawk River to give us that much water. Our floods are usually caused by the fact that we live on what used to be a swamp and the land doesn’t drain so nice sometimes. He’s a good boy. The cuteness is just icing on the cake. Oh no. Not good. I’m glad you had help and cuteness but the lack of cookies is almost another crisis in and of itself. You need a scotch.. So in total three crisis’ averted this Christmas. Hope you didn’t lose anything with the flooding. My complacency with sump pumps was the only major loss. Ohhh so too much scotch..
Or he was born to look good in boots. Either way . . . Damn sump…as reliable as…well me, I suppose. Everyone knows you came unplugged a long time ago. I have no basement anymore, no sump pump anymore, no flooded basement anymore. My happy day has come. Of course, there is that dark, dirty, spider infested crawl space to deal with. Keep your spiders dry and they’ll never let you get lonely.